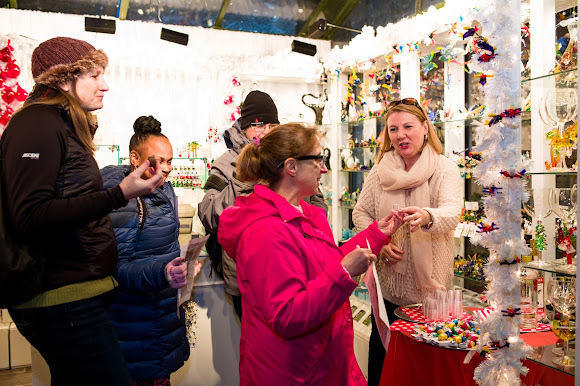 Join us for one of two art-themed walks, highlighting the incredible array of art vendors at the Bank of America Winter Village Holiday Shops! Art Walk participants will receive a handy map and embark on a self-guided tour to check out the shops, chat with the artisans, and learn more about their work. Refreshments will be available at select shops. All participants will be eligible to spin our prize wheel for a chance to win a Holiday Shops gift certificate or other Winter Village prize at the end of their tour*. Please sign up for your wristband and map at the Park Shop and Info kiosk, next to the Rink entrance. *while supplies last. Limit one prize per person. Event check-in closes at 7:45pm. Prize must be collected by 8:00pm. conversation with a Holiday Shops artisan.